San Diego County Sheriff's Deputies shot and killed a man in Alpine on Monday afternoon. Matt Boone reports. 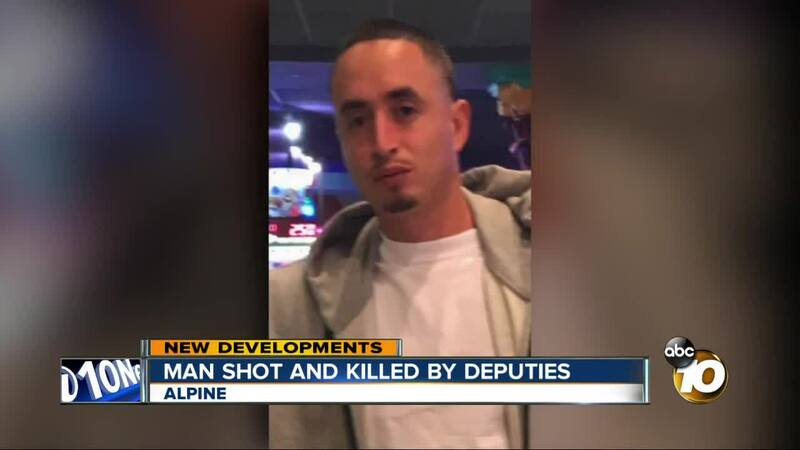 ALPINE, Calif. (KGTV) -- A man has died following a deputy-involved shooting in Alpine Monday afternoon. The man's family later identified him as Daniel Ayala. According to the San Diego County Sheriff's Department, deputies shot Ayala at an apartment complex on the 2600 block of Alpine Boulevard around 3 p.m. during a confrontation. No deputies were injured, sheriff's officials said. According to Lt. Michael Blevins, dispatchers had received several 911 calls reporting a man yelling in the apartment complex. Blevins said at one point he made statements threatening to kill people. A witness told 10News, Ayala had pounded on his door, yelling incoherently. When deputies arrived they say they went up to Ayala's apartment. "He exited the apartment with a knife in his hand and advanced towards the deputies," said Lt. Blevins. That's when the deputies opened fire. Blevins said more than one deputy fired a gun, though he said they were still investigating exactly who discharged their weapon and how many shots were fired.